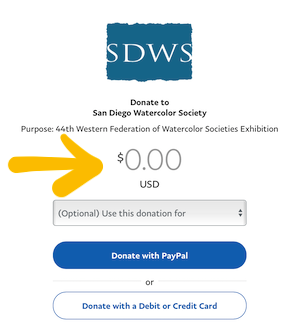 Please consider a donation to support the 2019 44th Western Federation of Watercolor Societies Exhibition in San Diego this year. 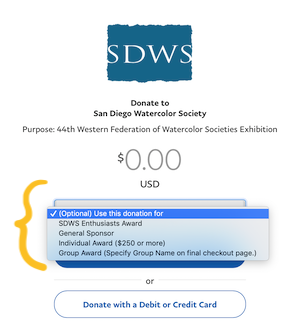 Donate any amount up to $249 and your contribution will be combined with other donations for the SDWS Enthusiasts Award. 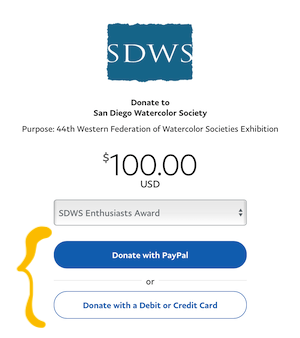 Rather than contributing to an award, you can donate in support of the overall costs of managing the Exhibition. Donate $250 or more and an award can be presented under a name that you select. Please type selection in notes of final checkout page. Donate with a group accumulating $250 or more and an award can be presented under a name selected by the group. Please type selection in notes of final checkout page. Note: Deadline for your contribution to be acknowledged in the 2019 Western Federation Exhibition catalog is March 1, 2019. The following steps are provided as a guide for making your donation. If you have any trouble, please email technology@sdws.org for help. After clicking the donate button, you will be taken to the payment screen. Step 1: Add the amount you wish to donate. Step 2: Click the gray box to let us know how you wish your donation to be used. Step 3: Choose how you would like to pay. If you have a PayPal account, click the blue button. If you do not have a PayPal account, click the white button. 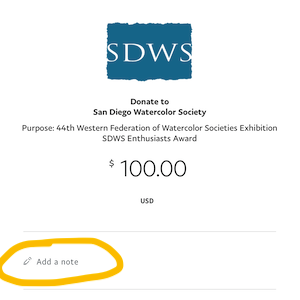 Step 4: If you are paying by PayPal, please use the "Add a note" section to specify the name of the group award you are contributing towards or how you would like your Individual Award of $250 or more named. 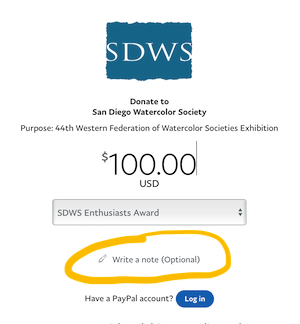 Step 4: If you are paying directly with a credit or debit card please use the "Write a note" section to specify the name of the group award you are contributing towards or how you would like your Individual Award of $250 or more named. 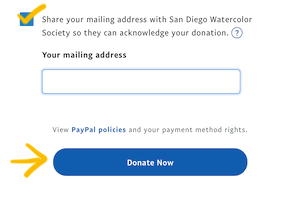 Step 5: Check the box to share your mailing address with SDWS so we can acknowledge your donation and click the blue Donate Now button to complete your transaction.